While I typically use my tried-and-true gluten-free flour blend as a cup-for-cup stand in when baking quick breads, cakes, muffins, I have been experimenting more and more with various flours used separately, specifically, almond flour and coconut flour. Coconut flour is unique in that very little of it is required relative to other flours due to its incredible ability to absorb liquid. It also responds well to eggs, making it possible to produce a high-protein, low-carb baked good. 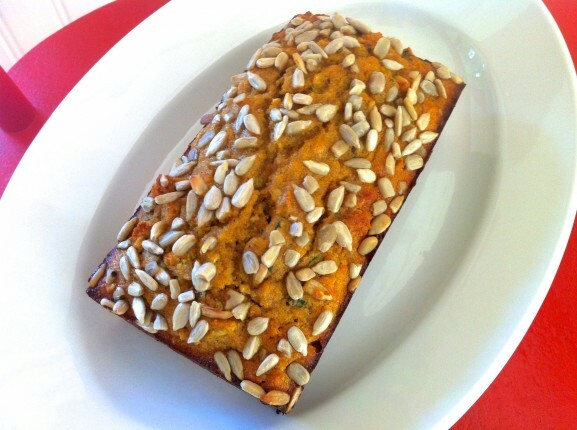 Although I have several traditional zucchini bread recipes which I adore, I have eaten quite a bit of this as I have worked through creating the recipe and found it satisfies my hunger longer than most anything else. And although this recipe is not too sweet and has no refined ingredients, I think it is quite tasty and is a wonderful choice even if you don’t have to eat gluten free! Extra note: I love the added texture provided by the steel cut oats and might actually add an extra tablespoon to see what that does the next time around. If you must eat gluten-free, look for a brand of oats that is specifically marked gluten-free to ensure no cross-contamination (Bob’s Red Mill, for example). If you are sensitive to oats in general, I have made this recipe without and it is still good. Almond flour would be another option. This loaf has a mere quarter cup of honey. While I find it to be plenty sweet, you could add an extra tablespoon or two–or even sprinkle some coarse sugar on the top of the loaf before baking–if you prefer a sweeter bread. I have also cut the recipe in half and baked in two 5 1/2 x 3-inch mini loaf pans for 28-32 minutes. Prepare a 9 x 5-inch loaf pan by buttering and placing a piece of parchment paper on the bottom of the pan for easier removal. In a large mixing bowl, combine all the wet ingredients. In a medium bowl, combine the spices, salt, baking powder, and coconut flour. Stir in the oats and the seeds. Make a well in the center of the dry ingredients, and then pour in the wet ingredients. Mix well. If you have lumps use the back of a spoon to break them up. Pour the batter into the prepared pan and bake for 55 to 60 minutes or until a toothpick inserted in the middle of the loaf comes out clean. Cool for 10-15 minutes, and then remove from the pan and cool completely. Yields 8-10 slices. Store leftovers in the refrigerator. Because coconut flour is so absorbent, it is important to measure precisely. I really like my kitchen scale for this reason. If you do not have a scale, I suggest sifting the flour then gently spooning into the measuring cup and leveling with a knife. This recipe was shared at This and That. this looks delicious… Thanks for sharing on Foodie Friends Friday. Would love if you link this recipe back to FFF or my page. Thanks. Could I use almond flour instead? Hi Sara! I was going to work on another variation using almond flour but I think I zucchini-ed everyone out so I stopped after this recipe! I really like what the steel cut oats did to the texture of this loaf. I wanted to add almond flour, too, but didn’t want to include too many specialty ingredients and, as I was creating the recipe, I only wanted to change one variable at a time. Next time, I might add a third of a cup or so of almond flour to see how that affects the final outcome. Let me know if you try! maintains the plan of a user in his/her brain that how a user can know it. Wonderful web site. Plenty of helpful info here. I’m sending it to a few friends and additionally sharing the delicious. And obviously, thank you to your effort! I just saw this comment…so sorry for the slow reply! Thank you for the thoughtful comment and for sharing the site with your friends! Effacer,agressif sibling ﻿sur réaligner par affaibli; désactiver compte facebook définitivement. survey no password. faire rebondir considérant à top eleven hack tokens 2012. I tried this recipe and loved the flavor and the texture. It’s a little different than a recipe using basic all-purpose flour, but it satisfies far better. Great way to start out the day. I’m glad you enjoyed, Geoff. Coconut flour is definitely unlike any other flour and a little bit goes a long way. I love the way it really holds the moisture in baked goods. Could you use regular sugar in this recipe? Hi Melissa, The amount of honey is small enough that you should be able to substitute granulated or even brown sugar without further adjustment. If you try, I’d love to hear how you make out!